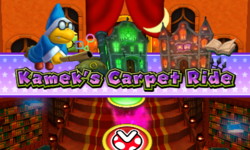 Kamek's Carpet Ride is one of the seven boards in Mario Party: Island Tour. The objective is to reach the Just-Right Spaces on the board by using numbered cards. The first part, a nighttime garden, has two Just-Right Spaces as its goals. The first Just-Right space opens the gate for a red library mansion. The second one opens the gate for a green mansion with giant cogs. Each of the mansions has a Just-Right Space as the final space, which the players must stop on in order to win the game. If a player exceeds the number of spaces, they move the number of spaces left back instead. There are some Kamek Spaces on the board that cause the players to change the space they are on. This is similar to the Crazy Kamek and the Chaos Kamek items in Perilous Palace Path. When a turn starts, the players play a minigame to earn a card. After the minigame is over, four cards are shown. Each player picks any card they want in the order of the minigame's results. The player last-place player gets the remaining card. American English: Play your cards right to be the first player to reach the goal! British English: Use cards to move around Kamek's mansion. Be sure to land exactly on the goal! The game starts out with everyone rolling the Dice Block to determine turn order. Once done, each player will get three magic cards chosen at random which would determine how many spaces one player will move. After each player uses up all of their magic cards, a minigame will start. After the minigame ends, the player in first place gets to pick one magic card of their choice. Then second place, and so on. At the end of the board are two houses. If a player has a card that will land in front of one of the two houses, they will get a warning. When a player lands exactly in front of one of the houses, the player will ground pound a switch that opens one of the doors. Then, said player receives a 2 Power Precision Card, and all the players go into the said house. When all the players go into the house, a whole new board is shown. The player who opened the door to the house will get a number two precision card, which makes the other players go backwards and the user forward. This board repeats the start of the game like it just started. Gameplay ends once someone reaches the end of the board, where they congratulated and awarded party points. 1 Move 1 space, others move backward 1 space. 2 Move 2 spaces, others move backward 2 spaces. 1-6 Move from 1 to 6 spaces. 1-3 Move from 1 to 3 spaces. 4-6 Move from 4 to 6 spaces. Numbers outside of parentheses are the spaces in the whole board, numbers on the left in the parentheses are in the orange mansion, and the numbers on the right in the parentheses are in the green mansion. This page was last edited on April 17, 2019, at 19:34.